Heat up the grill to prepare a Warm PHILLY Mexican Spread! Make this Mexican spread with cream cheese to serve with your favorite woven wheat crackers. Combine tomatoes, garlic and dressing. 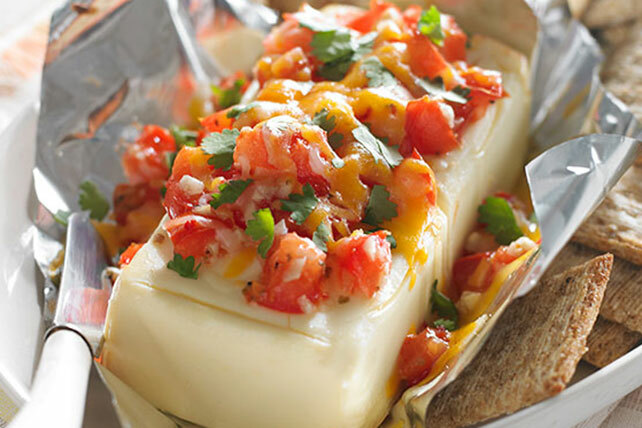 Place cream cheese on sheet of heavy-duty foil; top with tomato mixture and shredded cheese. Place on grill grate. Grill 8 to 10 min. or until shredded cheese is melted and cream cheese is softened but still holds its shape. Sprinkle with cilantro. Serve with crackers. Prepare this recipe year-round by assembling recipe on foil-covered baking sheet and baking in 375ºF oven 12 to 14 min. or until shredded cheese is melted and cream cheese is softened but still holds its shape. Serve as directed. No heavy-duty foil on hand? Just use a double-layer of regular foil instead.